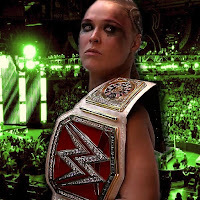 As seen below, TMZ Sports recently caught up with RAW Women's Champion Ronda Rousey in New York City as she prepares for the "Winner Takes All" main event of WrestleMania 35 with Becky Lynch and SmackDown Women's Champion Charlotte Flair on Sunday. There have been rumors of Rousey taking some time away from WWE after Sunday's match. Rousey was asked what's next for her. "I don't know, I guess I'll have to reconsider my life after Sunday. It's a do-or-die moment, so we'll see," Rousey said. Rousey was also asked about the anti-WWE rant from John Oliver on HBO's "Last Week Tonight" program a few days ago. While Big Show (at this link) and The Miz (at this link) defended WWE against the comments earlier this week, Rousey offered some support for Oliver. "I love John Oliver. I'm a huge fan," Rousey said when asked if she still supports Oliver.